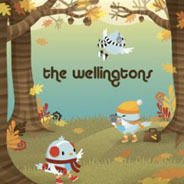 The jerky New Wave sound of the Wellingtons, from Melbourne, is closer to that of a generic American pop band: shades of Weezer, echoes of the Cars and a large dash of early Elvis Costello. It's energetic but unremarkable, hurtling by in a powerpop blur of bright guitars and splashy keyboard inoffensiveness. The best track is, not surprisingly, a cover (the Posies' ‘Conversations’). Sadly the record, contrary to its title, is heading nowhere but the charity shop.